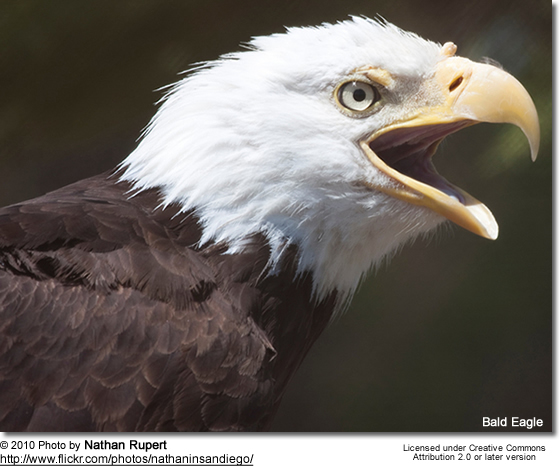 The Bald Eagles or White-headed Eagles(Haliaeetus leucocephalus) are the only species of eagles that are solely native to North America, and these large birds of prey are, therefore, commonly referred to as "American Bald Eagle" or, simply, "American Eagle." 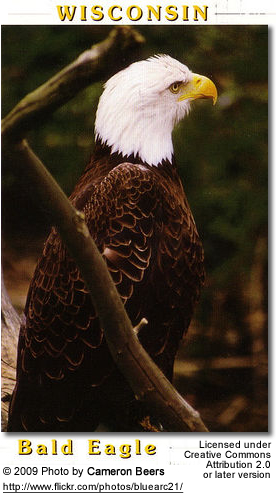 As members of the sea and fish eagle group, they are not only powerful fliers, but they are also strong swimmers. 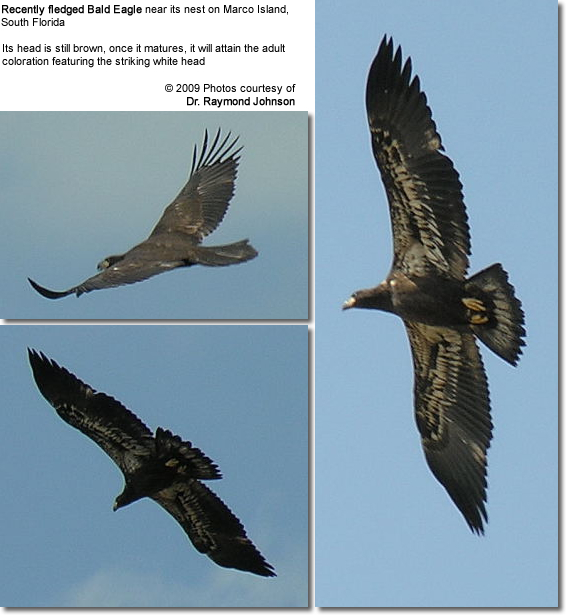 They are closely related to the Eurasian White-tailed Eagle - and these two species probably diverged in the North Pacific, as the White-tailed Eagle spread westwards into Eurasia and the Bald Eagle spread eastwards into North America. 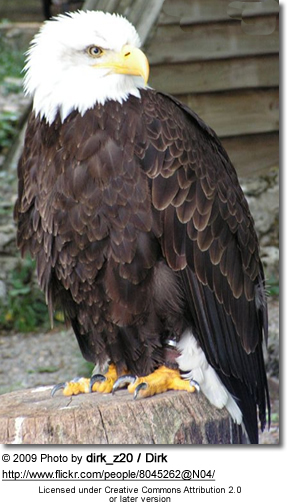 The Bald Eagles occur naturally throughout the continental United States, Canada and northern Mexico. Their range stretches from Alaska east and south through Canada to Newfoundland and into the United States, where they are found in scattered locations. The largest Black Eagle population is found in Alaska, where about half of the estimated 70,000 Bald Eagles on Earth occur, followed by Florida and then Minnesota. Vagrants has been reported in Belize, Bermuda, Puerto Rico and the US Virgin Islands, and even as far away as Ireland, where one individual was found that is believed to have been blown out to the sea and then struggled across the Atlantic Ocean, where it was then discovered by a national park employee in a northern heath. Depending on their location, they are either resident (non-migratory) or partially migratory. Resident populations are mostly found along the Atlantic, Pacific, and Gulf coasts. Migratory birds leave areas with bodies of water that freeze during the winter and either move south or to the coast. These raptors are commonly found near lakes, rivers, marshes and seacoasts and other large bodies of water with an abundance of fish. During the winter, they are usually found along the coasts or large rivers. 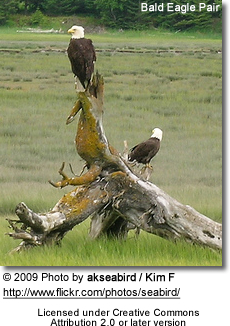 They require old-growth and mature stands of coniferous or hardwood trees for perching, roosting and nesting. The northern race ranges throughout Alaska, most of Canada and across the northern United States from the Pacific Northwest to the Great Lakes and Maine coast. Range: Found in southern United States - from roughly the latitude of Delaware Bay in the east and San Francisco in the west, south to Baja California in northwestern Mexico and east along the Gulf Coast to Florida. 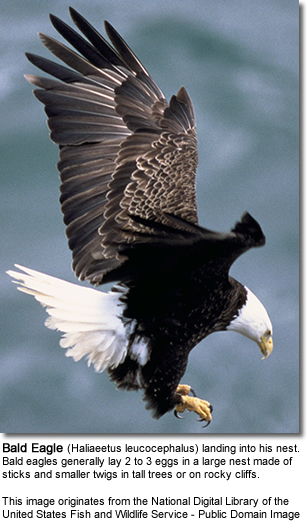 Bald Eagles measure between 28 - 40 inches (70 - 102 cm) and have a wingspan of 5.6 - 7.9 ft (1.7 - 2.4 m). They usually weigh between 5.5 - 14.3 lbs (2.5 - 6.3 kg). Females tend to be about 25 percent larger than their male counterparts. Females average a weight of about 13 lbs (5.8 kg), and males about 9.0 lbs (4.1 kg). Size variations have also been noted by location. The closer they are to the tropics, the smaller in size they tend to be. The smallest birds are found in Florida and the largest birds in Alaska. The adult is easily identified by his or her blackish-brown body with contrasting white head and tail. The slightly wedge-shaped tail is moderately long. The beak, feet and eyes are yellow. 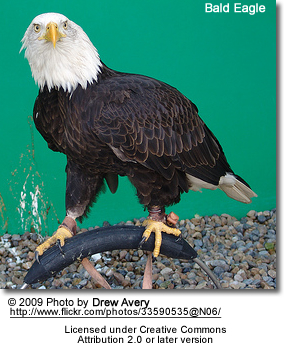 The legs are feather-free, and the toes are short and powerful with large claws (talons). The large beak is hooked, with a yellow cere (fleshy, featherless area above the beak). 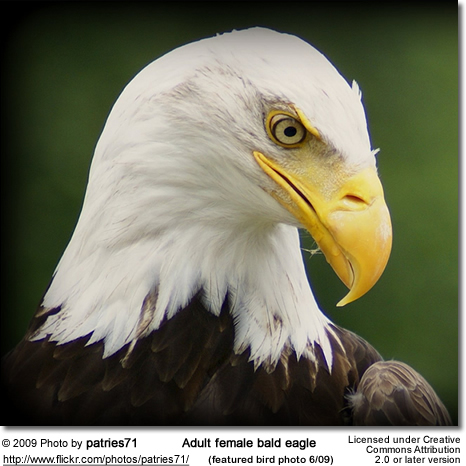 Males and females look identical as far as plumage details are concerned; however, females tend to be about 25% larger than males. Immatures have a mottled brown and white plumage. The distinctive white head and body doesn't develop until the fifth (rarely fourth, very rarely third) year. They can be distinguished from the similar juvenile Golden Eagles by their blotchy white coloration on the underside of the wings and tail. 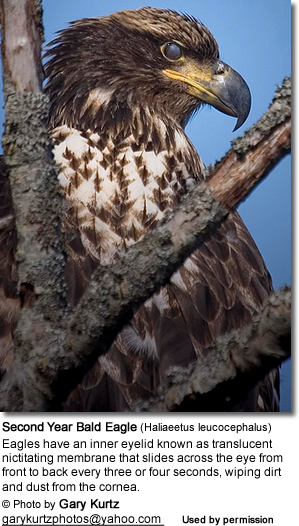 Immature Golden Eagles have a more sharply defined white pattern. 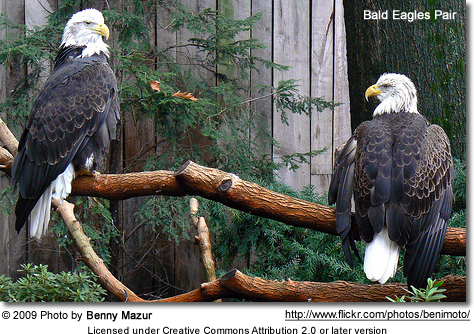 The Bald Eagles have featherless legs and the Golden Eagle has feathers extending down the legs. 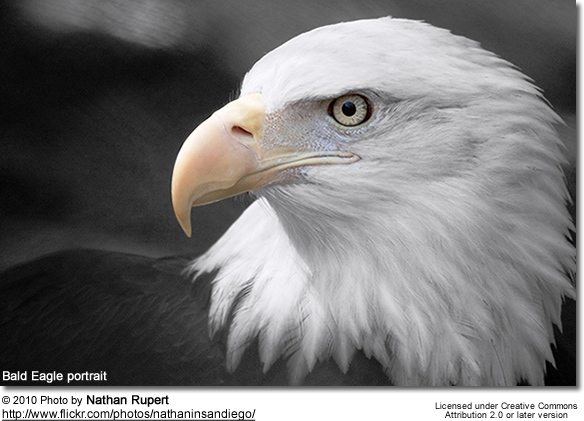 The juvenile Bald Eagle has a more protruding head, a larger beak and straighter edged wings than a Golden Eagle. 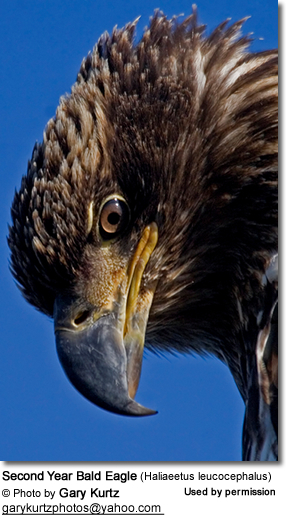 They resemble the Eurasian White-tailed Eagle; however, the White-tailed Eagle has an overall somewhat paler brown body plumage. 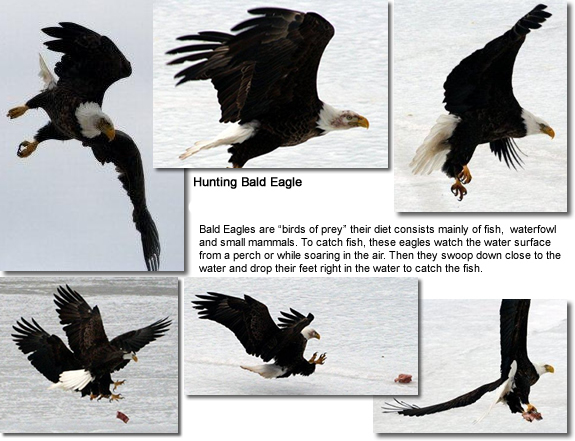 Bald Eagles feed mainly on fish, such as trout and salmon; however, they will also take carrion (dead and decaying flesh), waterfowl (up to the size of Canada Geese), reptiles, crustaceans (such as crabs), rabbits, raccoons, deer fawns, beavers and small rodents. They may also scavenge or steal from campsites, picnics and garbage dumps. Fish are caught by these birds swooping down over water and snatching them out of the water. Birds may be grabbed and killed in mid-air. Groups of them may hunt cooperatively, with one bird distracting a prey while another ambushes it from behind. These birds of prey may also steel prey away from other raptors. 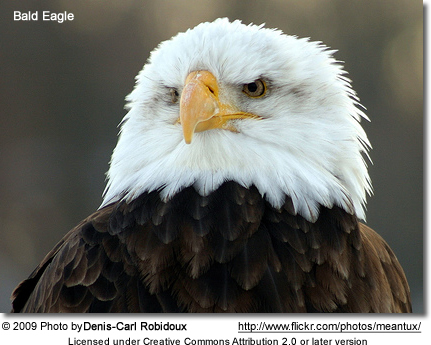 Bald Eagles are monogamous. Once they are paired up, they will remain together until one of them perishes; or they may "divorce" and find other mates, if their reproductive attempts have been unsuccessful. Less than 10,000 breeding pairs are believed to still exist. When they are old enough to breed, they usually return to the area where they were raised. Their unusual courtship ritual entails chases, rolls, dives, swoops and cartwheels, in which they fly high, lock their talons (claws) together at high altitudes and then tumble and somersault towards the ground, breaking apart at the last minute. Once the female is ready for copulation, she lowers her head in a bowing gesture allowing the male to mount her. 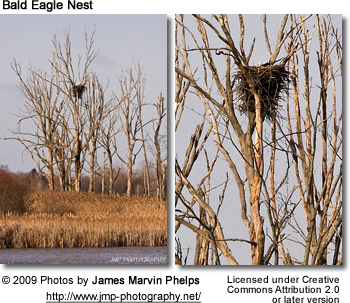 The nest site is generally located near some bodies of water, such as rivers or coasts, in forested areas with large, tall trees. Occasionally, they may also nest on rocky cliffs or pinnacles or on the ground, if no trees are available. They also may take advantage of tall artificial structures, such as power line poles and osprey nest platforms. 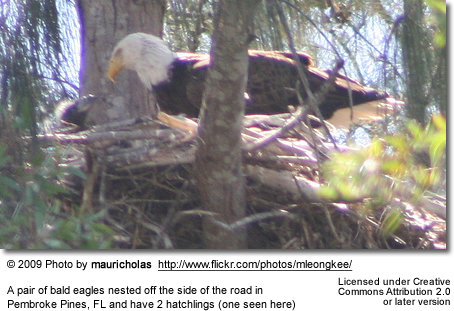 Nests are constructed out of sticks and are usually reused over several nesting seasons. Pairs will repair and add on to their existing nests and over time nests can grow to weigh up to 4,000 lbs or two metric tons, and can have a width of 8.2 feet (2.5 meters) and a depth of 13 feet (4 meters) . Their nests are amongst the largest once in the world. 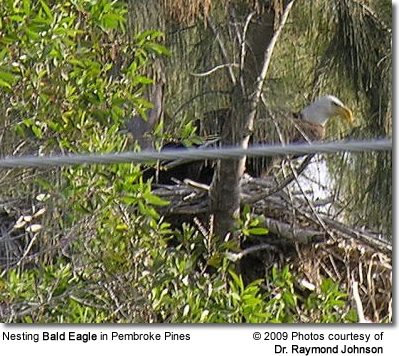 In fact, the largest tree nest ever known for any animal was a Bald Eagle nest in Florida, which measured 9.5 feet (2.9 meters) across, had a depth of 20 feet (6.1 meters) and weighed 5,400 pounds or 2.7 metric tons. A clutch can consist of 1 - 3 eggs, but mostly 2, and eggs are laid a few days apart. Each egg is about 2.9 inches or 73 millimeters long and 2.2 inches or 55 millimeters wide. The incubation starts with the first egg and lasts about 5 - 6 weeks, and brooding is shared by both parents. 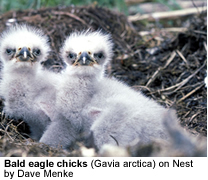 The first emerging chick grows fast and the larger and stronger chick has a food advantage over the younger siblings. The third emerging chick often doesn't stand much of a chance when competing for food, and chances are slimmer for the second chick as well. Both parents protect and feed the young. The young fledge when they are about 12 weeks old and their dependence on their parents decreases over time as they improve their hunting skills. They are usually independent at 20 weeks. Their calls are described as weak chirping whistles and squeaks. The vocalizations of immature birds tend to be harsher and more shrill. Contrary to popular belief, their calls are nothing like the "eagle screams" often depicted on the television, which are actually the calls of the more common Red-tailed Hawks. 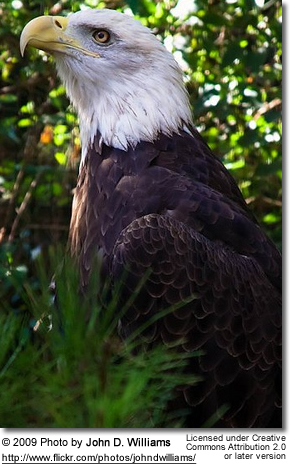 In the wild, these eagles are expected to live 20 up to potentially 30 years, provided they make it to adulthood. Only about fifty percent of all fledglings will survive the first year. Adults perish due to fatal gunshot wounds, electrocution, poisoning, collisions with vehicles or starvation. 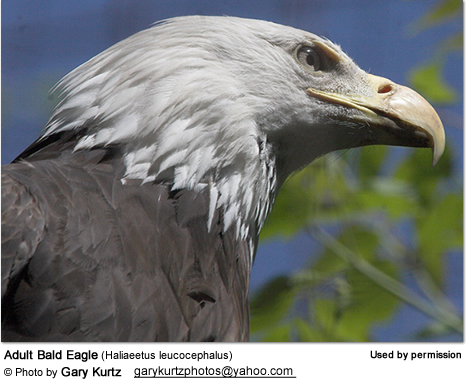 The oldest recorded wild Bald Eagle, however, was 28 years old. Captive birds are more protected and well fed, and one bird held captive in New York has been reported to have lived for nearly 50 years, and other are said to have even reached to old ripe age of 60. They reach reproductive maturity when they are 4 to 5 years old.